He was born in 1973. He got a higher education. He graduated from the Kazakh National Technical University with a degree in mining engineering. He began his career in 1992, working his way from the worker to the head of the territorial department of the central government body. From 1998 to 2008 he worked as a leading specialist, a chief specialist, a principal specialist-inspector of the Semipalatinsk Inspection of geology and mineral resources of the Eastern Kazakhstan territorial department of the Committee of Geology and Subsoil Use of the Ministry of Energy and Mineral Resources of the Republic of Kazakhstan. 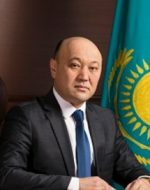 From March 2008 to 2012 he worked as a Head of the Semey Regional Inspectorate of geology and mineral resources of the Eastern-Kazakhstan Interregional Department of Geology and Subsoil Use Committee of Geology and Subsoil Use of the Ministry of Investment and Development of the Republic of Kazakhstan. From April 2012 to February 2013 he worked as a deputy head of the Eastern Kazakhstan Interregional Department of Geology and Subsoil Use «Vostkaznedra». From 2013 to October 2014 he worked as a head of the Eastern Kazakhstan «Vostkaznedra» Committee of Geology and Subsoil Use of the Ministry of Investment and Development of the Republic of Kazakhstan. On October 1, 2014 he was appointed a Deputy Chairman of the Committee of Geology and Subsoil Use of the Ministry of Investment and Development of the Republic of Kazakhstan.